So when I say this may be my favorite way of eating beets – You should know it’s not just good, it’s CRAZY good. Do consider yourself warned; Ever since I discovered this recipe, I have been making and eating it non-stop. I may have possibly exceeded my lifetime quota of beet consumption at this point. Actually, I wasn’t even looking for another beets dish. I was browsing online to find something to cook with za’atar that I finally bought at a local Middle Eastern market after hearing and reading so much about it recently. And although I had been perfectly happy with my beets repertoire, when I came across this Yotam Ottolenghi recipe, I knew I had to try it. Za’atar definitely lives up to the hype. Its deeply savory flavor elevates otherwise more familiar combination of ingredients in this gorgeous dip. Oh, and there are hazelnuts, of course. 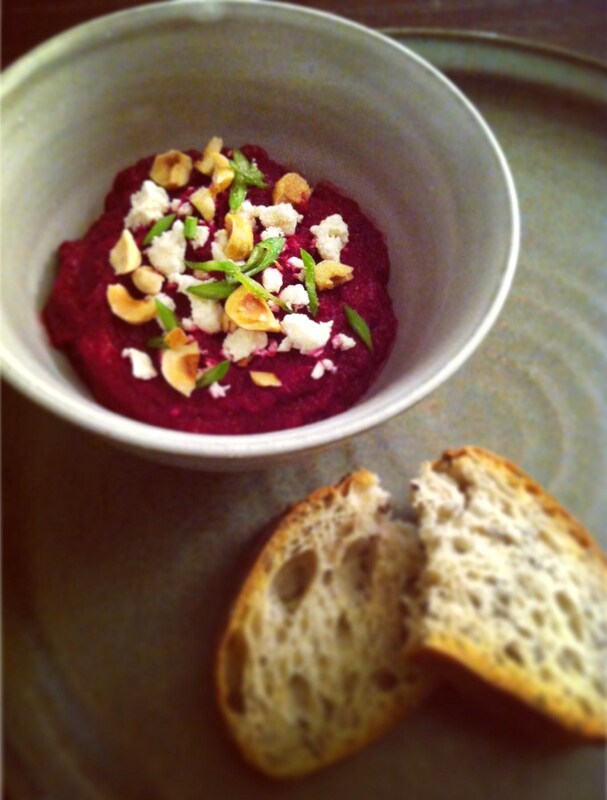 My choice of nuts with beets has always been walnuts but this is totally converting me to the team hazelnuts. They just exude elegance and sophistication, but when combined with rustic and earthy, candy-sweet beets – It is absolutely positively pupil-dilatingly divine. And yes, your cutting board, kitchen towel and hands will be all dyed in bright pink no matter what. But there is no other way as far as I know. That’s what beets do and it is so worth it. Preheat the oven to 425°. Wrap the beets in foil and bake for about 45 minutes until tender. To check, unwrap one of the bigger ones and poke it with a toothpick. If it is soft enough so it goes through smoothly, take them out and unwrap the top to let cool slightly. Peel the beets, cut into wedges and transfer to a food processor. Add the garlic, cayenne and yogurt and pulse until blended. Add the olive oil, agave syrup and za’atar and puree. Season with salt. Scrape into a bowl and scatter the hazelnuts, cheese and scallions on top. Serve with bread.